Dawgust is nearly over for 2017!. There are still a few pledges to come in, but including these the fund stands at £7,446.85. Amazing. The Charity Auction finishes this Saturday evening and is currently standing at a further £1,300, which will be added to the above figures once people have paid. Not too late to bid for lots of lovely items. 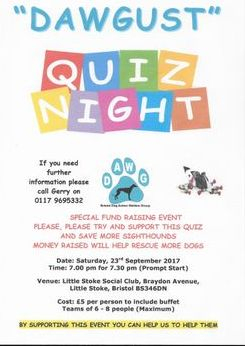 The Quiz on 23 September is the final event in this year's Dawgust and, at the moment, needs to raise £1,253.15 to achieve a total of £10,000. Remember Colin has agreed to match whatever is made on the evening, so with your support I am sure we will achieve this record-breaking figure. Thank you to everyone who has contributed this year, your support is greatly appreciated. 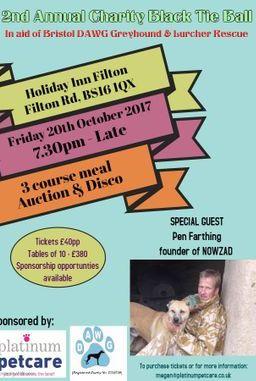 If you have an "Eila dog" and you have that Friday feeling, its not too late to contribute via the link below. Phew!!! What a last minute frenzy that was in the Auction! Thank you everyone for bidding. Please bear with us while we make our infamous spreadsheet. All winners, totals and how to pay will be available tomorrow morning. Thank you to Susan Grant at Asda, Longwell Green who presented us with a cheque for £200 today from the Green Token Scheme - thank you customers of Asda Longwell Green you are very kind. 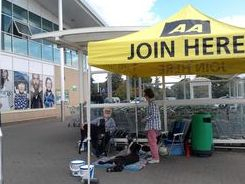 Thank you to the lovely AA man who lent us a gazebo to keep the dogs out of the sun at our fund raising today. If it hadn't been for him we'd have had to abort the collection. Luckily, by the time he was ready to leave, there was a patch of shade just big enough for Poppy, Kookie and Hilly and the whole area was in shade by the time we'd finished. The picture above shows volunteers Frank and Lesley with Cooper, Fran and Eugene. Busy, busy day today but very well organised, although Gerry's house did look like a bomb had hit it. Thank you to Megan and Kim for organising the charity auction for DAWGUST - Megan's spreadsheets are amazing!! Lots of items already gone off to new homes. Total amount raised £1526, which was more than last year. 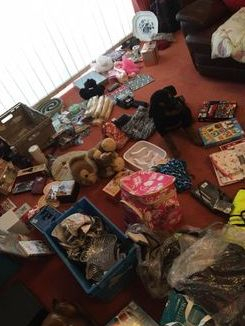 Some people still have items to collect which are either with Megan or Gerry - think Megan has messaged everyone who needs to pick up. We have got the weekend off to a good start. Gerry spent a lovely hour this morning with the Roberts family in Long Ashton who have adopted the very handsome Jody - such a good boy. Jody has settled with his new girlfriend, Chloe, also a greyhound and both dogs are getting on really well. Thank you so much for giving Jody a wonderful new home. Thank you also to Denise Smart for foster dog number nine!! You do an amazing job with all your fosters, thank you so much. In the early hours of Thursday morning, we are expecting to by joined by Jilly, Tilly and Sugar from Ireland. We don't have much more information on them at the moment, so we are really looking forward to meeting them. Thanks in advance to Kristie and James, who, as ever, will be getting up at silly o'clock to settle them in. Beautiful brindle Bridie will be joining us from Limerick in the early hours of Thursday morning. 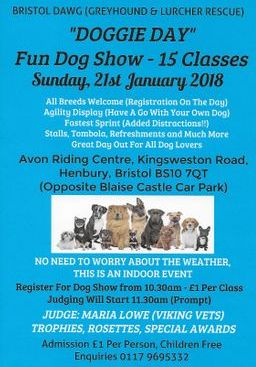 As ever, the wonderful Kristie Davies and her husband James will be getting out of their warm bed to welcome Bridie to Tonew Kennels. Thank you to everyone who attended the Quiz Night today and thanks to the people who brought along food and extra raffle prizes. What a greyt night!!! We raised an amazing £615.27 - well done Megan you were determined to make Colin pay!!! With him matching this amount and Gift Aid, it took the Dawgust total to £10,782. What a fantastic gesture from Lynette Butler (Flash's mum) who will donate a further £218 to make a fabulous £11,000 raised for our very good friend Eila Moloney. The cheque is in the post! Dawgust has really shown us what a fantastic "Team DAWG" we have supporting the work we do. Thanks to Colin for setting the quiz and to Little Stoke Social Club, and of course to all of you who have supported 2017 Dawgust. Thank you to Jan Lasenby who undertook a Table Top Sale on today at St Peter’s Church in Frampton Cotterell and raised an amazing £50. Thanks for your hard work Jan.
Gerry spent a lovely hour in Worle this morning completing the adoption for Roger. Peter and Barbara are absolutely thrilled to be adopting him and are totally smitten. Thank you both for giving Roger a wonderful new home. We must also say thank you to Jess and Andy for very kindly fostering Roger - foster dog number eight and you haven't failed yet!!! You are amazing and do a brilliant job with all your fosters and we are lucky to have you supporting us. 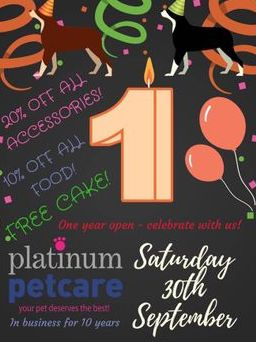 Today was the first anniversary of the pet shop/grooming parlour opened by our greyt supporters Platinum Pet Care. We congratulate Kim and Megan Simpkins-Jenkins on a successful first year and wish them many more.